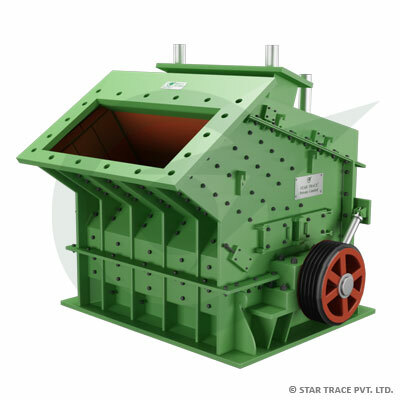 STAR TRACE in impact crusher is a new type of high-efficiency crushing equipment. This crusher mainly consists of board hammer, impact plate, board hammer pedestal, rotor, and feed port etc. Being simple, reliable and energy-efficient, our impact crusher is one of the most frequently used rock crushers. Large feed size and high crushing chamber are suitable to crush hard and big materials. Space between impact plates and hammers can be adjusted conveniently, so the shape and size of final product can be controlled. New type of abrasion-proof materials are used, so life of hammers, impact plates and lining plates is much longer. High chromium hammer and unique lining plate are suitable to crush hard stones efficiently.